One thing I love about the lengthening evenings of May is the chance to spend some time on my deck or porch after dinner. What am I doing out there, besides listening to the birds? Reading, of course. Here are 10 books to put on your list this month. Whether you like crime or history, facts or fantasy, you're sure to find at least one book that calls to you. Aunt Dimity and the Widow's Curse by Nancy Atherton (Viking, May 30): This is the 22nd installment in a much-loved cozy mystery series featuring a young mother and her dear departed aunt. This outing involves one of Lori's elderly neighbors and a possible black widow-style curse. Good fun, set in England with a friendly ghost, and you can jump into the series right away; no need to start at the beginning, though why miss out? The Graves by Pamela Wechsler (Minotaur, May 2): The second book in the Abby Endicott series, set in Boston, promises to keep you guessing. Our protagonist, a chief district attorney in the homicide unit, is dead set on bring justice to a serial killer who is preying on young women. Class issues, politics, and the judicial system all come into play as Abby tries to help find the killer without becoming the next victim. What My Body Remembers by Angnete Friis (Soho Crime, May 2): Get ready for a new Scandinavian crime novel set in Denmark, which takes us on an emotional journal as a young woman struggles to recall the murder she may have witnessed when just a little girl. Will uncovering family secrets heal her or put her and her son in danger? Themes of parenting and PTSD round out the tightly woven plot. 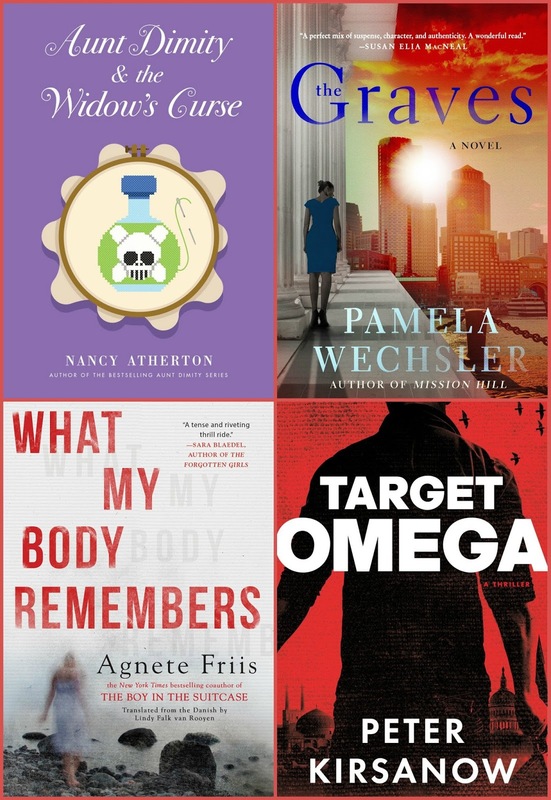 Target Omega by Peter Kirsanow (Dutton, May 16): This timely thriller pulls us into the world of weapons of mass destruction and the people who really shouldn't have access to them. As the only survivor of a special ops mission, our man Michael Garin is either very lucky or the perpetrator of the mishap. Intelligence agencies from Iran and Russia and even from his own U.S. government are to get Garin, who must stay alive along enough to thwart a horrific terrorist plot. 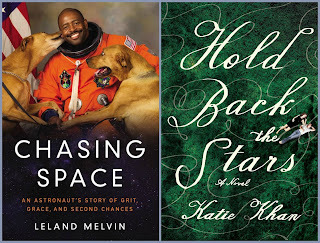 Chasing Space by Leland Melvin (Amistad, May 23): In this fabulous memoir, Melvin recounts his transition from NFL wide receiver to NASA astronaut. His story is one of overcoming setbacks, holding fast to one's dreams, and grabbing on to second chances. Melvin takes us behind the scenes, both on the ground and in space, as we follow his inspiring career. Plus, who doesn't love that book cover? 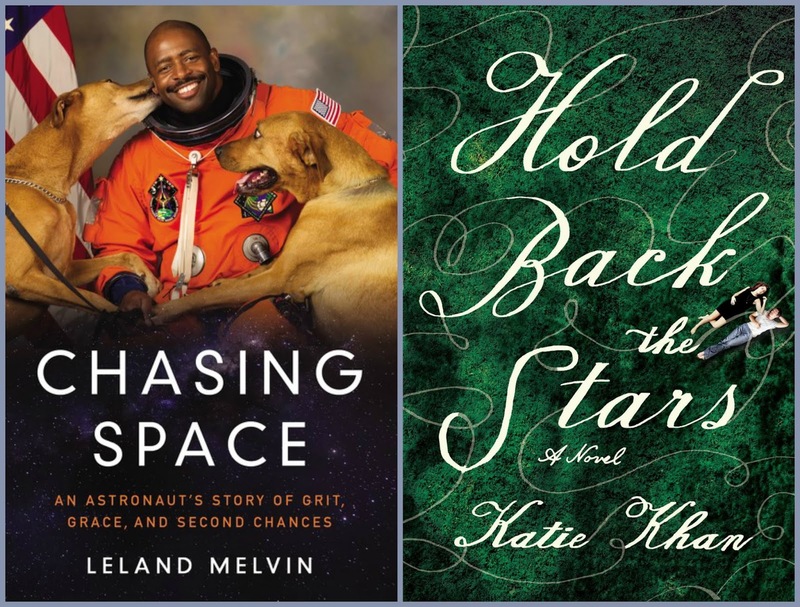 Hold Back the Stars by Katie Khan (Gallery Books, May 23): In an astronaut's worst nightmare, Carys and Max are left floating in space with only a finite amount of oxygen and no one else in sight. If only one of them can be saved, who will it be and will they be able to make the decision? This novel is the perfect blend of action, romance, and literary fiction. 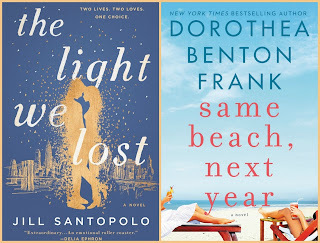 The Light We Lost by Jill Santopolo (Putnam, May 9): Fated or star-crossed? 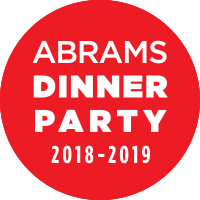 Lucy and Gabe meet in college at Columbia and connect over their visions of the future as well as their mutual attraction. Careers, however, take them on different but crossing paths, and as the years go by, they wonder what could have been (or could still be?). A contemporary love story that explores the dilemmas, emotions, and practical decisions that help and hinder twenty-first-century relationships. Same Beach, Next Year by Dorothea Benton Frank (William Morrow, May 16). 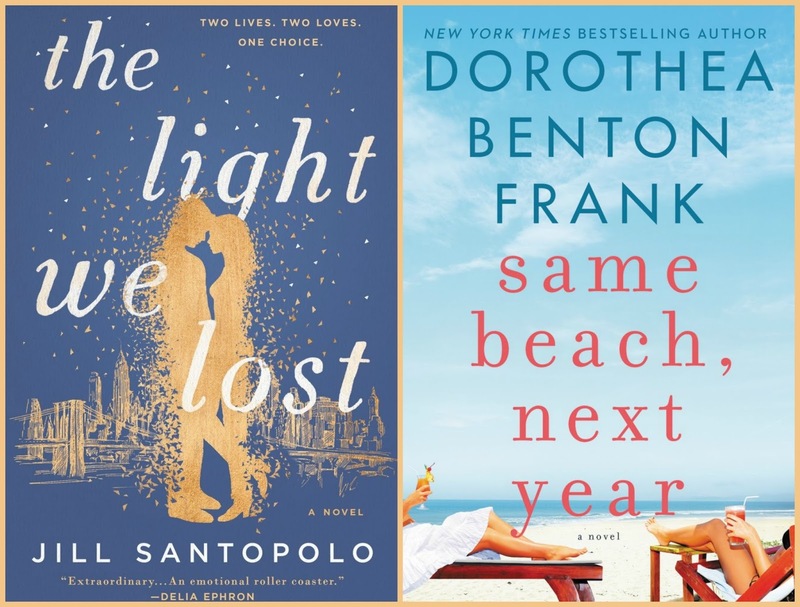 Frank is the queen of the beach read for women of a certain age, and her latest novel takes us back to her beloved Lowcountry and a story that spans two decades. Two couples witness and share years of jealousies, victories, tragedies, and everyday living as they meet each year for their summer at the beach. A thoughtful, intelligent, and witty story. 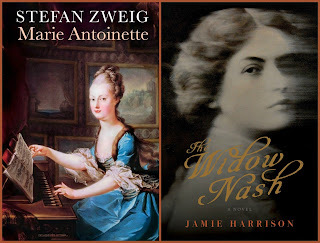 Marie Antoinette by Stefan Zweig (Pushkin Press; May 2): The definite biography of the famous French queen is being re-issued in an English translation this month. 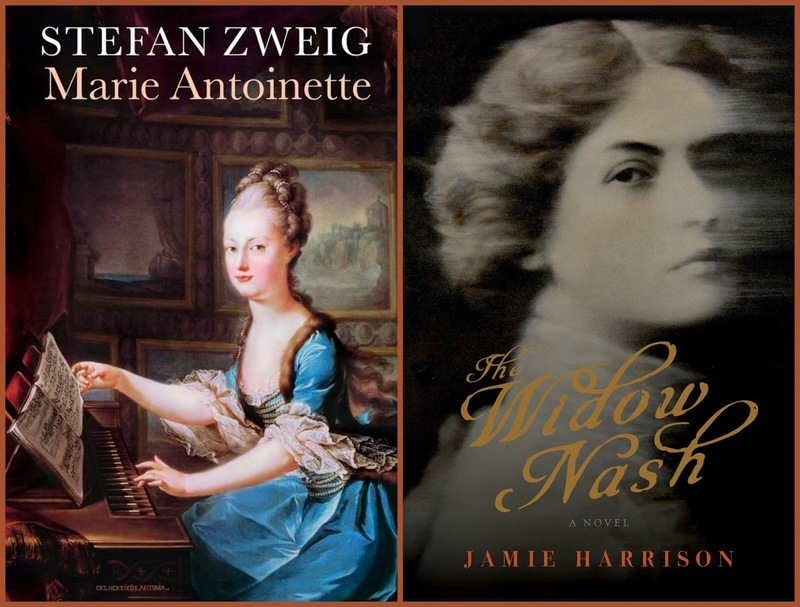 Based on Marie Antoinette's personal letters and other firsthand accounts, Zwieg exposes the private, human side of a woman who had few choices over her own fate. From her teenage political marriage that took her to a foreign country to her imprisonment during the French revolution, she tried to play her expected role, suppressing her own desires. The Widow Nash by Jamie Harrison (Counterpoint, May 22): In the early 20th century a young woman's life changes after her father, recently returned from a trip to Africa, seems to have lost both his fortune and his mind. While on a train carrying her father's body across the country for burial, she slips away at a Rocky Mountain station, leaving her controlling fiance and her old life behind. Soon she's settled in Montana, where she's known as a wealthy widow, but has she truly escaped her past? Historical fiction that's garnered lots of buzz. That football player to astronaut memoir sounds intriguing! Anything with space and the stars will be of interest to my astronomer husband! Lots of good books here today, I need to amend my library list now. I adore the cover of Chasing Space. Thanks! Added What My Body Remembers, the Light We Lost and The Widow Nash to my TBR list! Same Beach, Next Year & The Widow Nash caught my eye. 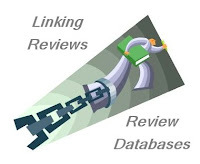 I've seen no real reviews of The Light We Lost, but I keep seeing publicity on it. I'm intrigued. Great list of books to read. Thanks! 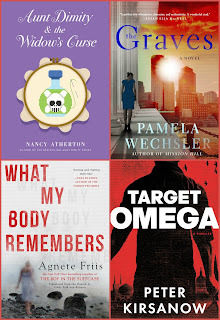 I'm definitely in the mood for mysteries and modern day stories so adding some of these titles to my TBR list! Hope you get a chance to enjoy these! i love a good mystery ... so thanks!!! I just read Same Beach, Next Year and it really put me in a summer mood (as does this 90 degree heat!). The Widow Nash looks very interesting as well.